Much has been written, discussed, designed and manufactured when it comes to "head gear" for alpacas and llamas. As long as one can get the nose through the noseband and buckle the crown piece on the back of the neck, it should work... or does it? An alpaca or llama halter is one of the most important pieces of equipment we will ever consistently use with our animals. A proper fit is absolutely crucial to safety, comfort, behavior and performance. To see just how this is so, it is important to understand the physical dynamics involved. Alpacas and llamas are semi-obligate nasal breathers. 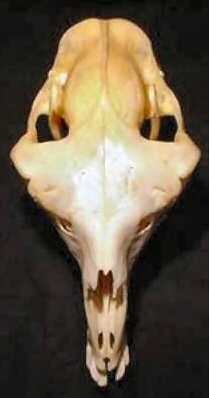 This means they are obligated to breathe primarily through their nose in order to sustain life over the long term. Though they can breathe through the mouth, nasal breathing is essential for grazing, cud chewing, etc. For them, halter placement is crucial to their ability to breathe freely through their nose. There is a significant difference for why halter placement on many other animals may not normally require as much precision. 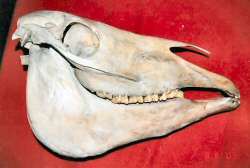 Many animals have an extra length of bone that extends out over the nasal passage as seen in the photo of the horse skull. Unlike the horse, alpacas and llamas have no protective length of bone and very little room for variance in safe halter placement. The noseband of the halter must fit safely and comfortably around the face between the eyes and the point at which the nose bone dramatically declines. 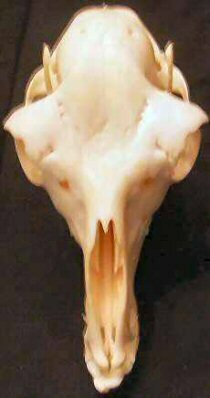 As can be seen from the photo of the skull of the adult male alpaca and adult male llama below, this is not a very wide distance. Typically, this distance is about the width of an adult human finger… and, interestingly, about the width of the material normally used in the making of halters. Cartilage begins where the bone ends and becomes softer and more easily compressed on its way towards the lips. Imagine both this alpaca and llama once in full fleece with big brown eyes. Imagine how much longer and firm the length of the nose would appear. This length, however, is in appearance only. What we see can be quite deceptive regarding just how much area truly is available for appropriate placement of the halter noseband. The safe, comfortable and optimum performance area for placement must be on actual bone. As can be readily seen in the photos, this area is rather narrow. What happens when the halter is not sitting on the firm, stable and immobile bone surface and there is a pull on the lead rope? It can compress the cartilage. The further down the nose the noseband sits, the more severe the possible compression. This compression restricts airflow (hence the ability to breathe) as it begins to flatten the passageways through the nose to the lungs. In extreme cases, this has actually caused the death of an alpaca or llama. This is absolutely true. Proper halter fit can literally mean the difference between life and death. 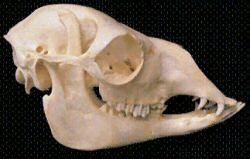 Look at the bone structure of this same male alpaca and llama from another angle. Looking down from the top we can clearly see that very narrow area of solid bone. With only this small area of bone for safe and proper fit, how is it likely that we could ever purchase a halter without bringing along our alpaca or llama for sizing? Just as no two humans have precisely the same face shape and size, neither do our animals. All halters should have a noseband, cheek pieces, throatlatch and crown piece though I have seen some that were missing one or more of these elements. Understanding the functional details of each piece of the halter is equally important. The longer the cheek pieces, the further down the nose the nosebandmust sit or the further down the neck must sit the crown piece - sometimes, both. The throatlatch serves to stabilize the bottom of the noseband as well as assist in minimizing any shift from side to side. It is most useful to have a longer crown piece with a number of holes available for optimum adjustment. 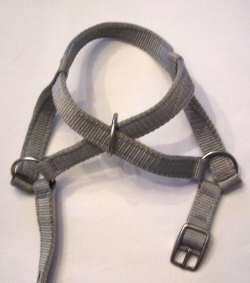 There are a wide variety of alpaca and llama halters available. The three most common designs are (1) the fixed noseband (solid sewn circle noseband), (2) the X-style and (3) the adjustable noseband. The fixed noseband halter is the most unlikely of the three to easily fit properly. Remember the children's toy "Rings on a Cone"? The colored rings are of varying sizes with each ring able to move only so far down the cone as is in accordance with its inner circumference. So it is with the fixed noseband halter. It will only move as far up the nose of our alpaca or llama as its inner circumference will allow. Like the ring on the cone, it is not possible to adjust it any further than it will go. Wherever that might be, all we can then do is fasten the crown piece about the neck. The X-style halter really has no fixed noseband to speak of in providing a distinct way to stabilize and maintain a proper noseband adjustment. To expand the noseband, slack must be taken from the area of the throatlatch forcing both the cheek pieces and the crown piece downward. To make it smaller, a great deal of slack must be taken up in the crown piece crimping the cheek pieces. With any pressure, the ring to which the lead is attached is often free to move from side to side along what would be a combination of the noseband and throatlatch. This can have the effect of changing the placement and size of the "noseband" from side to side as it follows pressure and changing angles from the lead rope. This frequent movement under the chin area can trap bits of fiber pulling it out by the roots. While either the fixed noseband or x-style halter designs can fit and function well on a specific animal, the only halters that can truly be adjusted to fit nearly every alpaca or llama face are those with an adjustable noseband. It follows that a halter with an adjustable noseband providing a large range of options for proper fit would be a safe, non-distracting and comfortable choice. 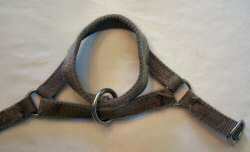 Keep in mind - any halter has the potential for disaster if not properly adjusted. A halter should be balanced. What does that mean? Fasten the crown piece and hold the halter out in front of you with one hand on the noseband and the other on the crown piece. As you move the halter in varying ways, do all the parts flow easily together with each movement? Do all the parts remain in proportion to one another? Is there enough flexibility throughout or do certain parts of the halter remain stiffly in position causing another part to crimp or buckle? This is an important "test" as every alpaca and llama face is a bit different. Each part of a halter should remain balanced within the whole while still maintaining the ability to adjust to the variations in head shape and size. We have considered safety. How does a properly fit halter - a safe halter - affect comfort and behavior? It would seem reasonable that an ill-fitting halter would be uncomfortable as well as distracting. Consider the distraction within ourselves should our pants be too tight or heaven forbid, our underwear should consistently "ride up"! It is not only uncomfortable but it is distracting and interrupts our focus. The above "human" distractions are certainly not life threatening but what if we felt they could threaten our life? What if those things were actually affecting our ability to breathe easily? What if we just feared that they could? How might that affect our behavior, our comfort, and our concentration and focus... our overall and immediate emotional stability? In my many years of working with difficult alpacas and llamas, I have witnessed some rather amazing attitudes expressed behaviorally by both with regard to their halters. One of the most profound was a llama who was impossible to handle while haltered. She flipped between violent movements and a frozen stance. Her eyes were held extremely wide open darting here and there in what could only be described as panicked fear. She wore a red, fixed noseband halter, which sat well beyond the bone on the softer cartilage of her nose. Like the ring on the cone, it was up as far as it could go and was held firmly there by the crown piece. It was causing her great distress. Upon removing her fixed noseband halter, I began to fit her with an adjustable noseband but -- still a red colored -- halter. She would have no part of it bucking wildly in her attempts to stay as far from that "thing" as she could. Hmmm... I began to wonder about the color. The red one she had worn before had clearly caused her distress. We put away the red halter and tried once again with a black one. Piece of cake! She did not particularly mind wearing a halter just as long as it fit properly and… was not red! Considerable instruction has been given over the years on ways in which to fit a halter safely, functionally and with comfort to the face of a specific alpaca or llama. In well over 20 years of haltering alpacas and llamas (not only my own but 100's of others), I have experienced the explanations of a wide variety of "how to" methods. With awareness, properly fitting a halter for an alpaca or llama is fairly simple. Assuming you are using a halter with an adjustable noseband, simply set the size of the noseband at a larger sizing. Placing the halter on your animal, fasten the crown piece in its proper position - somewhat high behind the head and tight enough to be quite secure in its placement, but not uncomfortably tight. Go back to the noseband and adjust the size to fit the shape of your particular alpaca or llama face leaving enough room for eating, chewing cud and other various needs/functions. Should the noseband be left too large, it is possible for it to move/bend forward at the top to an unsafe position. A properly sized and placed noseband does not have to be fit tightly. As long as it is not loose enough to move forward, it will be held in position by the crown piece. You can check your adjustments in three ways. The crown piece should be secure and not easily moved up or down. Checking the noseband, place your hand on each side of the noseband and check the forward movement. Will it slip too far forward? If so, tighten the crown piece. By standing in front of your alpaca or llama and bending the noseband forward towards you, will the top portion of the noseband move off the bone? If so, take up some slack in the noseband. It is always wise, especially when there is a good bit of fiber present on the neck to check the crown piece adjustment after about 10 minutes. It is possible for the halter to settle into the fiber and become loose. Additionally, some halter materials may stretch somewhat when they heat up – particularly during hot summer days. Should this happen, simply tighten the crown piece another notch to account for the slack created. Many have asked me if enough room in the noseband can be adequately measured by our ability to place one or two fingers between the noseband and the animal's face. This could possibly be an adequate measurement depending upon the specific animal face, the type of halter and the size of the particular human fingers. However, it has been my experience that following the suggestions listed above for fitting a halter and subsequently checking the fit is a much more accurate test for insuring a safe and proper fit. It is not my intention in this article to endorse or promote any specific halter or vendor. My intention is to provide as much information as possible regarding halters. Halters are one piece of equipment we use nearly every time we interact with our alpacas and llamas. By taking the time to consider the many aspects that go into choosing a halter, it becomes possible to make our choice based on safety, comfort and performance - as well as for a specific color! And… their very lives depend on it. You cannot do a kindness too soon, for you never know when it will be too late.